Putting behind the ugly TV headlines that raked up avoidable controversy linking his wife Sakshi who was seen sitting beside betting-accused Vindoo Dara Singh in an IPL tie, Captain M S Dhoni would look up to a scintillating performance by his team against hosts England to add another coveted trophy in his showcase. “I will reply at the right time,” Dhoni had reacted on the controversy soon after Vindoo’s arrest and the subsequent hullabaloo over spot-fixing, arrests of three cricketers and many more. Now the time has come for Dhoni to respond the axe (detractors stabbing words) with a ton when Team India takes on hosts England in the Championship Trophy’s (CT) final at Birmingham, the second time India is appearing in the final after becoming the runners up to Sri Lanka in Colombo 11 years ago. 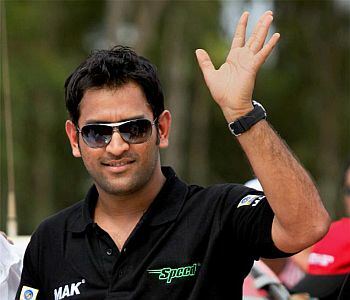 With a sweet run of success in the CT so far, Dhoni will expect his team mates to help him in giving back his detractors, who did not even hesitate to attack on the privacy of the Captain, who brought home trophies of the ICC World T20 in 2007, the Commonwealth Bank series 2008 and the 2011 World Cup through his able and courageous leadership. “Not many people like a person with so many successes under his belt…even Julius Caesar was stabbed by his close aide Brutus, who was unable to grasp the Roman Emperor’s exemplary courage and successes,” says cricket buff Akash. The Dhoni Juggernaut continues to keep Indian tri-colour fluttering, no matter how many studs his detractors would put on the path of Team India’s success. “After all, at the end of the day, it is the bat and the ball which matter for the fans, nothing else. And BCCI’s coffers are filled up with on-field exploits by the cricketers and not by any detractor,” contended Krishna Mahato. Former West Indies Captain Brian Lara has these wonderful words on Dhoni printed in a newspaper today: “A leader for me is not necessarily a captain wearing the arm band. It is someone who gets his hands dirty and shows true leadership. Dhoni’s success story should go on to instill positive energy in this shaky society of ours, feels, yours truly. Page rendered in 0.0765 seconds.